I was reading some of the news about Sony at this year's IBC, and noticed the attached picture. 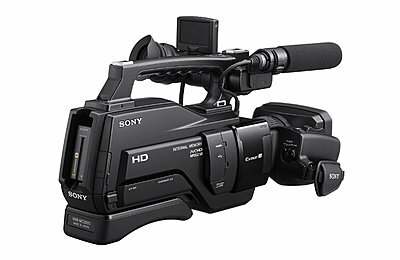 Could Sony be adding a tapeless version of the HD1000 to their line-up? Yes, you´re right: It´s called HXR-MC2000. 1080i + 720p50/60, 24mbps AVCHD, but only 1/4" chips? Surely they could've used the 1/3" sensors from the CX550/XR550? 1/3" inch chips, XLR's & a second control dial/wheel on the body and this thing would've been a big hit, even if it meant a higher price. You're right, seems like they could have kept a 1/3" chip & added XLR inputs. HMC70 isn't too much more expensive & it has XLR inputs. But I think the AVCHD is the way to go, and I find the NTSC / PAL SD formats at 9 Mbps a nice feature. Yeah sorry, I knew it was only one (hence why I suggested to use the CX550's sensor) but for some reason I've written it in plural form several times! It's good that they've put in a few more choices for recording formats, as well as the maximum possible bitrate for AVCHD.